Terra Forming Terra: Did An Extraterrestrial Speak To Us? I have posted on this in the past but we are revisiting it now to see if our perspective is changing. This movement could explain the growing sense of expectation describing an awakening by many sensitives. The material as written conforms to my expectations and does not dwell on technological excess. all that is a passing phase. I do not sense though that this material has been well distributed at all. . 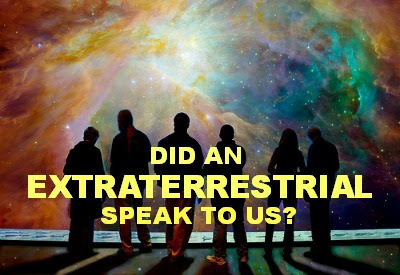 Looking Back: Did An Extraterrestrial Speak To Us? Whoever transmitted this translated message to you is irrelevant, and should remain anonymous in your mind. It is what you will do with this message which matters ! > Each one of you wishes to exercise her/his free will and experience happiness. These are attributes that were shown to us and to which we now have access. Your free will depends upon the knowledge you have of your own power. Your happiness depends upon the love that you give and receive. Like all conscious races at this stage of progress, you may feel isolated on your planet. This impression makes you sure of your destiny. Yet, you are at the brink of big upheavals that only a minority is aware of. It is not our responsibility to modify your future without you choosing it. Consider this message as a worldwide referendum! And your answer as a ballot! Who are we? Humankind’s entrance into the family of galactic civilizations is greatly expected. We can appear in broad daylight and help you attain this union. We haven’t done it so far, as too few of you have genuinely desired it, because of ignorance, indifference or fear, and because the emergency of the situation did not justify it. Many of those who study our appearances count the lights in the night without lighting the way. Often they think in terms of objects when it is all about conscious beings. Who are you? What is your situation? Except for rare occasions, our interventions always had very little incidence on your capacity to make collective and individual decisions about your own future. This is motivated by our knowledge of your deep psychological mechanisms. We reached the conclusion that freedom is built every day as a being becomes aware of himself and of his environment, getting progressively rid of constraints and inertias, whatever they may be. Despite the numerous, brave and willing human consciences, those inertias are artificially maintained for the profit of a growing centralizing power. Who are the “third party”? There are two ways to establish a cosmic contact with another civilization: via its standing representatives or directly with individuals without distinction. The first way entails fights of interests, the second way brings awareness. The first way was chosen by a group of races motivated by keeping mankind in slavery, thereby controlling Earth resources, the gene pool and human emotional energy. The second way was chosen by a group of races allied with the cause of the Spirit of service. We have, at our end, subscribed to this disinterested cause and introduced ourselves a few years ago to representatives of the human power who refused our outstretched hand on the pretext of incompatible interests with their strategic vision. That is why today individuals are to make this choice by themselves without any representative interfering. What we proposed in the past to those whom we believed were in a capacity to contribute to your happiness, we propose it now to...you! Most of you ignore that non-human creatures took part in the exercise of those centralizing powers without them being neither suspected nor accessible to your senses. This is so true that they have almost very subtly taken control. They do not necessarily stand on your material plan, and that is precisely what could make them extremely efficient and frightening in the near future. However, be aware that a large number of your representatives are fighting this danger! Be aware that not all abductions are made against you. It is difficult to recognize the truth! How could you under such conditions exercise your free will when it is so much manipulated? What are you really free of? Peace and reunification of your peoples would be a first step toward the harmony with civilizations other than yours. That is precisely what those who manipulate you behind the scenes want to avoid at all cost because, by dividing, they reign! They also reign over those who govern you. Their strength comes from their capacity to distillate mistrust and fear into you. This considerably harms your very cosmic nature. This message would be of no interest if these manipulators´ tutorate did not reach its peak and if their misleading and murderous plans did not materialize in a few years from now. Their deadlines are close and mankind will undergo unprecedented torments for the next ten cycles. To defend yourselves against this aggression that bears no face, you need at least to have enough information that leads to the solution. As is also the case with humans, resistance exists amongst those dominant races. Here again, appearance will not be enough to tell the dominator from the ally. At your current state of psychism, it is extremely difficult for you to distinguish between them. In addition to your intuition, training will be necessary when the time has come. Being aware of the priceless value of free will, we are inviting you to an alternative. What can we offer? A single thought, a single answer can drastically change your near future, in one way as in another. Your individual decision of asking in your inner self that we show up on your material plan and in broad daylight is precious and essential to us. Even though you can choose the way that best suits you, rituals are essentially useless. A sincere request made with your heart and your own will will always be perceived by those of us whom it is sent to. In your own private polling booth of your secret will, you will determine the future. What is the lever effect? This decision should be made by the greatest number among you, even though it might seem like a minority. It is recommended to spread this message, in all envisageable fashions, in as many languages as possible, to those around you, whether or not they seem receptive to this new vision of the future. Do it using in a humorous tone or derision if that can help you. You can even openly and publicly make fun of it if it makes you feel more comfortable but do not be indifferent for at least you will have exercised your free will. Forget about the false prophets and the beliefs that have been transmitted to you about us. This request is one of the most intimate that can be asked to you. Making a decision by yourself, as an individual, is your right as well as your responsibility! Passivity only leads to the absence of freedom. Similarly, indecision is never efficient. If you really want to cling to your beliefs, which is something that we understand, then say NO. If you do not know what to choose, do not say YES because of mere curiosity. This is not a show, this is real daily life, WE ARE ALIVE! And living! Your history has plenty of episodes when determined men and women were able to influence the thread of events in spite of their small number. Just like a small number is enough to take temporal power on Earth and influence the future of the majority, a small number of you can radically change your fate as an answer to the impotence in face of so much inertia and hurdles! You can ease the mankind’s birth to Brotherhood. One of your thinkers once said: “Give me a hand-hold and I’ll raise the Earth”. Spreading this message will then be the hand-hold to strengthen, we will be the light-years long lever, you will be the craftsmen to … raise the Earth as a consequence of our appearance. What would be the consequences of a positive decision? Every time, new choices would be offered to you. You would then decide by yourself to cross new stages if you think it necessary to your external and inner well-being. No interference would be decided upon unilaterally. We would leave as soon as you would collectively wish that we do. Depending upon the speed to spread the message across the world, several weeks, or even several months will be necessary before our “great appearance”, if such is the decision made by the majority of those who will have used their capacity to choose, and if this message receives the necessary support. The main difference between your daily prayers to entities of a strictly spiritual nature and your current decision is extremely simple: we are technically equipped to materialize! Why such a historical dilemma?